One of the questions I'm most often asked is how I come up with the ideas for my dishes. It's a domino effect really. A random inspiration leads to another, and eventually I have a composed dish in mind. I think that's why I stress the importance of using every meal you cook as a learning opportunity. You might not come up with a perfect plate every time, but elements of what you made will almost certainly come in handy in another dish! As an example, I'd like to share how this light, summery but deeply flavorful pasta dish came to be. I used to believe a creamy Alfredo sauce was the only way to go (I also used to think Olive Garden was real Italian food, so there's that.) Given the choice between any kind of tomato based sauce and a white sauce, I'd take the heavy cream, please and thank you. 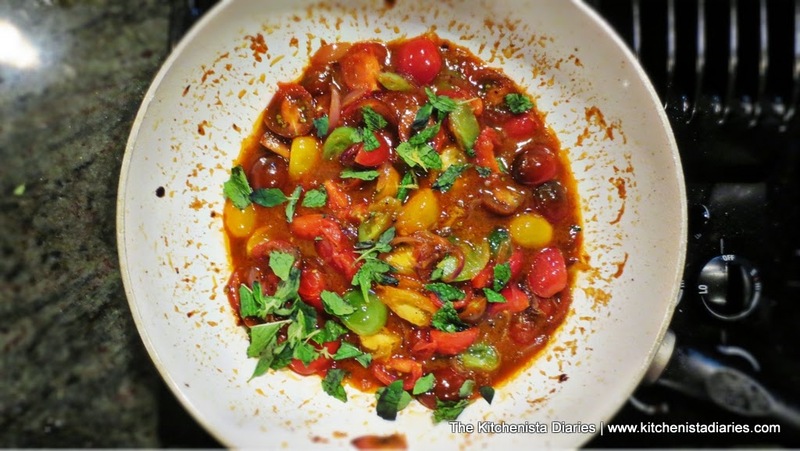 When I started watching the way chefs like Lidia Bastianich and Mario Batali cook, I noticed that good olive oil and ripe tomatoes took center stage in most of their pasta dishes. 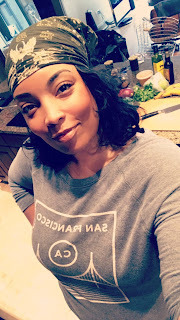 Intrigued, I started playing around more in my own kitchen. I quickly learned that a fresh marinara sauce takes mere minutes to make, a simple pinch of red pepper flakes packs an incredible punch, and anchovies might be the greatest secret weapon ever. In all of these cases, less is more - fewer ingredients shine, provided they are good quality and the freshest possible. My first "aha" moment didn't have anything to do with pasta but instead came as I was preparing fish a couple summers ago. 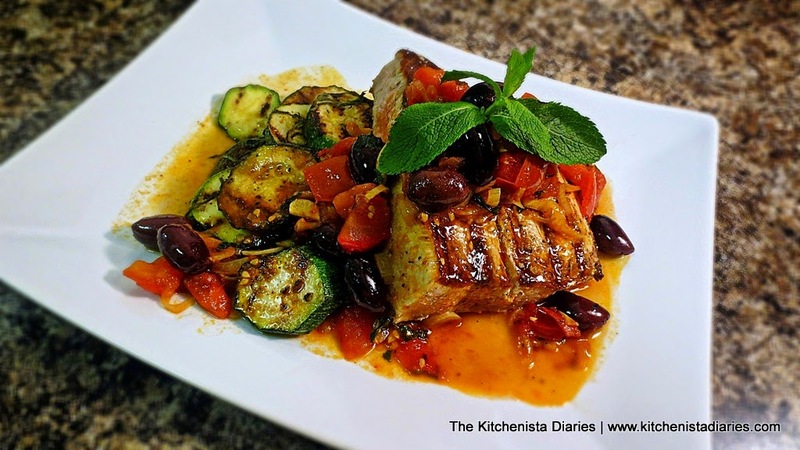 My plan was to quickly warm some chopped tomatoes and olives in olive oil to spoon over grilled swordfish and zucchini. I accidentally let the tomatoes cook too long, but I loved how they broke down into a light, spicy reddish sauce with the olive oil, which had been seasoned with a pinch of red pepper flakes and sliced garlic. I finished the sauce with mint. It was fresh, vibrant, and most importantly healthy. From that day forward, I never looked at tomato sauces the same way. 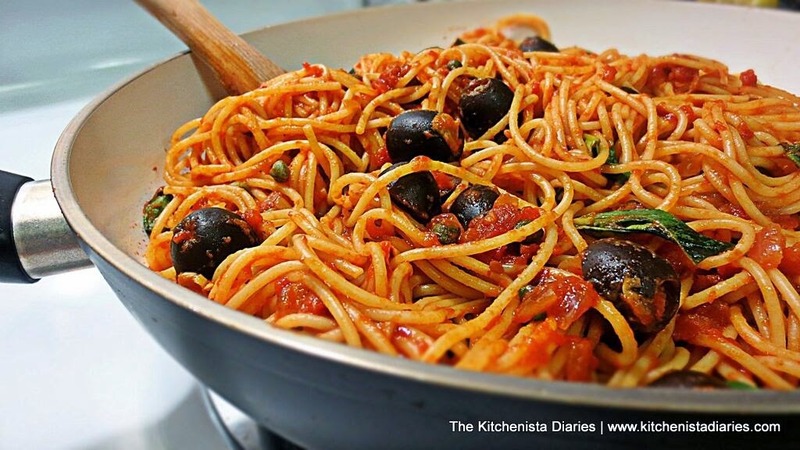 One of the first dishes I wanted to learn how to make was pasta alla Puttanesca. The name alone, which literally translates to "whore's pasta," intrigued me. 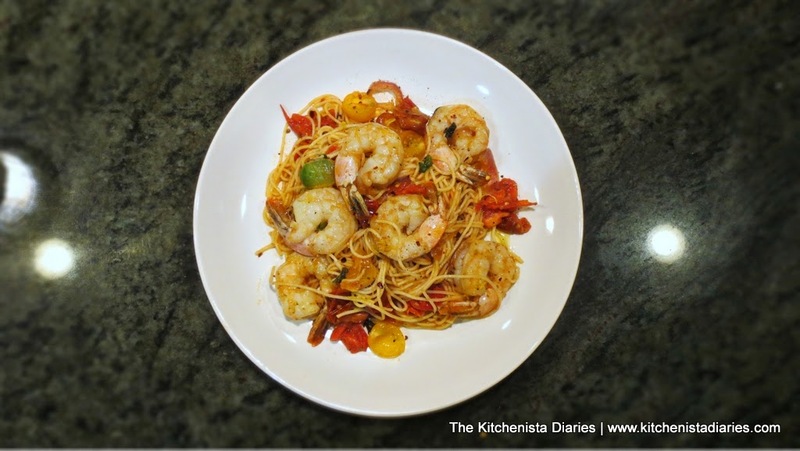 There are various stories behind how this name came to be, many quite colorful, but I was mostly drawn to being able to prepare this dish from pantry ingredients. Always a plus. I liked the idea of the garlicky, salty sauce from the olives and capers. The base of the sauce starts out very similarly to the one I'd been making, with olive oil and red peppers. Adding anchovies simply blew my mind. I was scared to do it, but as soon as the tiny fish fillets dissolved into the oil and the aroma hit my nose, I knew everything that followed was going to be magical. 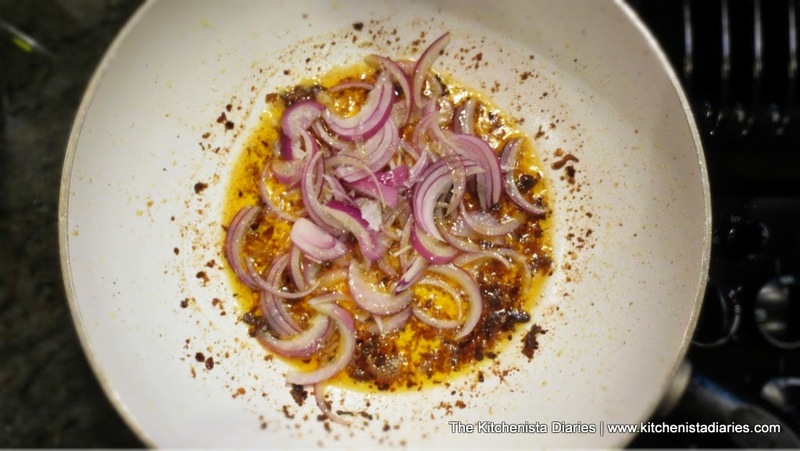 That became the beginning of many dishes which included anchovies to enrich my sauces. It doesn't make anything taste fishy in the way you'd expect. Instead it's that umami effect, in very much the same way Worcestershire sauce works to enhance the savory flavor of meat - but turned up a notch. An early attempt at pasta alla Puttanesca. In last month's issue of bon appétit magazine, I saw a spicy lobster pasta that really caught my eye. 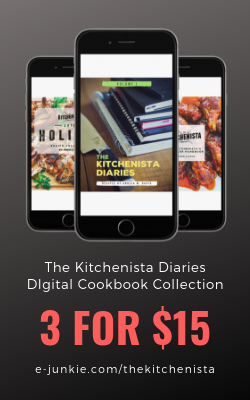 Seriously, if you aren't subscribing for the food photography alone, you're missing out. After reviewing the recipe, I liked where it was heading but wanted to take the flavors just a tad further to my tastes. I also knew I wasn't going to splurge on lobster - I'm one of those weirdos who just isn't all that moved by it - so I opted for shrimp instead. That led me to revisit a recipe I've been toying around with for awhile to create a Puttanesca style sauce for shrimp and angel hair pasta. 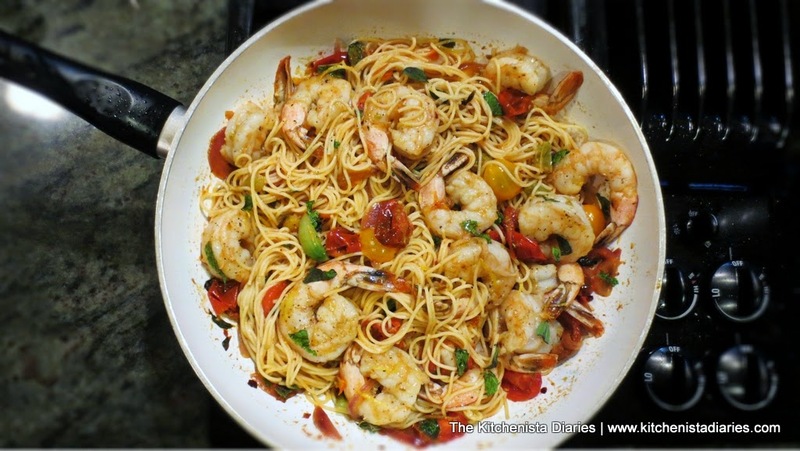 In previous attempts I felt like the olives and capers were a bit too much with the brininess of the shrimp. I wanted to stick with the anchovies though, so just like that my dinner idea was born. Applying what I had learned making spicy tomato sauces in the past, it was fairly simple to come up with a perfect summer pasta dish. 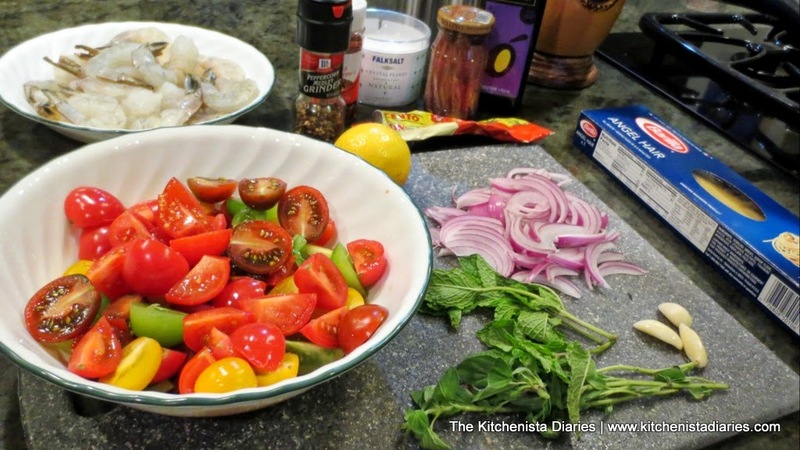 A gorgeous cherry tomato medley, plump shrimp, fresh basil and mint all came together beautifully. This was one of those quick weekend dinners I never expected to write about. After posting my shrimp and grits recipe, I didn't really want to follow with another shrimp dish. One of the great things about sharing food pics on Instagram and Twitter is how it allows me to gauge interest, and this one was immediately met with requests for the recipe. Some things are too good not to share, so here it is! I bought my shrimp already peeled and deveined to save time on prep, since I wouldn't need the shells. It's funny, just a couple days before making this dish I was joking about expensive gadgets in the Williams & Sonoma catalog. They had a cherry tomato slicer that at first take seemed pretty ridiculous to me but after chopping these babies up a few times in the past few weeks, I guess it would have more than paid for itself in time saved. Anyway, the prep work here is still pretty light and the tomato sauce can simmer unattended for a bit. This leaves you plenty of time to multitask a bit. I tore my herbs as I added them to the pasta at the end, instead of chopping them - you can do whatever floats your boat. 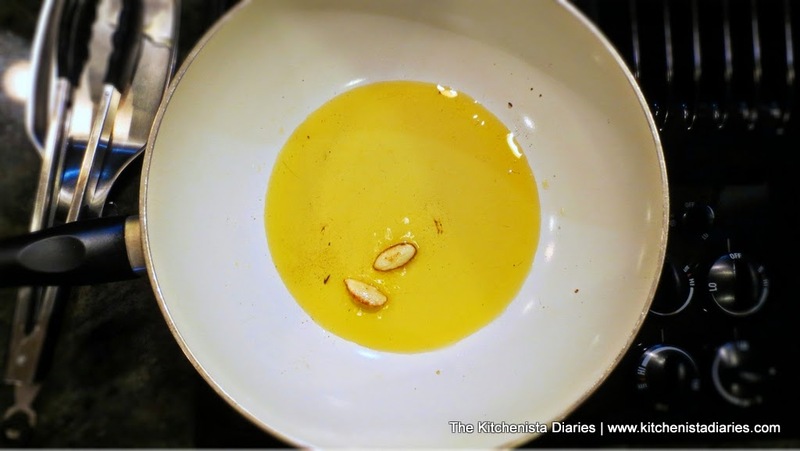 Add enough olive oil to coat the bottom of the skillet (a few tablespoons will do it) and add the garlic cloves. I crushed my cloves just enough to break the skin a bit. Allow the garlic to cook until it starts to turn golden brown, then remove it from the pan and discard. As Anne Burrell would say, "it has fulfilled its garlic destiny." I didn't want a garlic heavy dish here, just enough to flavor the oil. 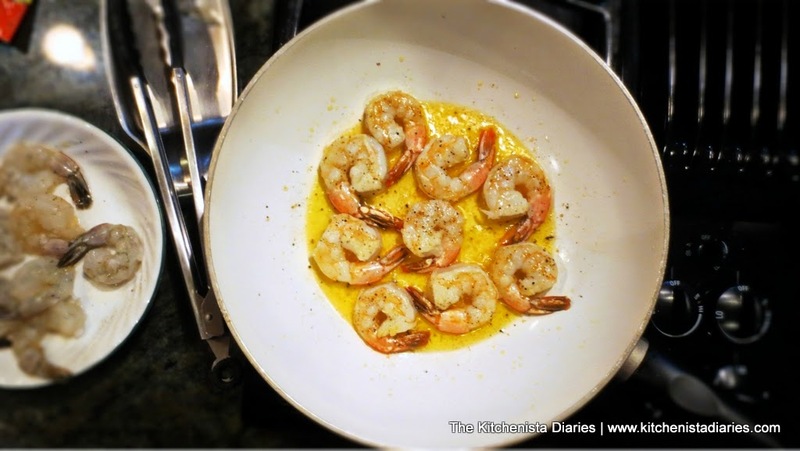 Season the shrimp with salt and pepper, then add to the skillet and cook until shrimp turns opaque, turning once. You'll want to do this in batches so that only what can fit in the pan in one layer is cooked at once. Remove from the skillet and set aside. These large shrimp take a couple minutes to turn opaque, and will be added back into the pasta later so don't overcook them. 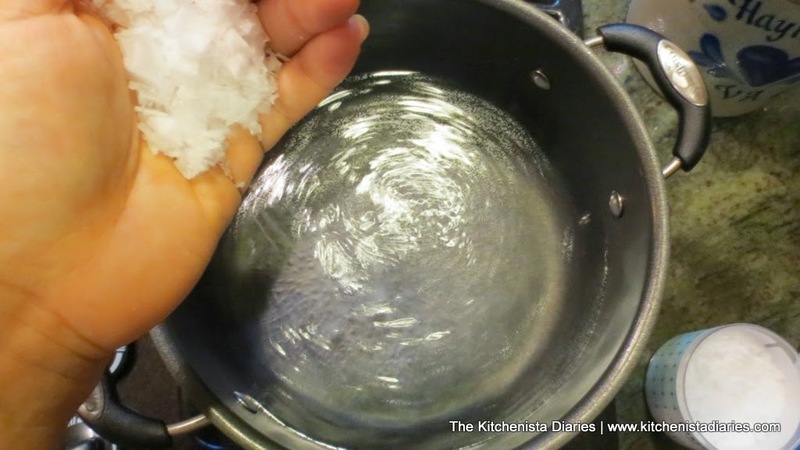 Bring a large pot of water to boil, adding a good amount of sea salt. The water should taste salty like the sea in order to adequately season your noodles. 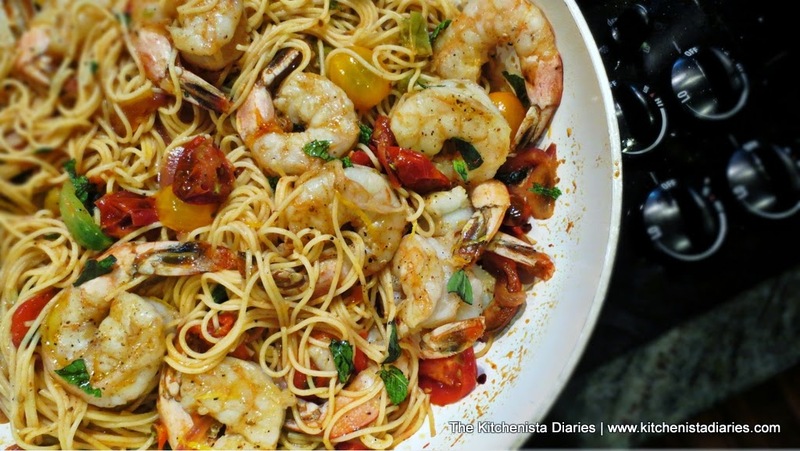 I am using flaked sea salt in this recipe instead of kosher salt. It's something I've switched back to lately for seafood dishes. In the time that it takes to heat up the water and cook the pasta, you'll be making the sauce. 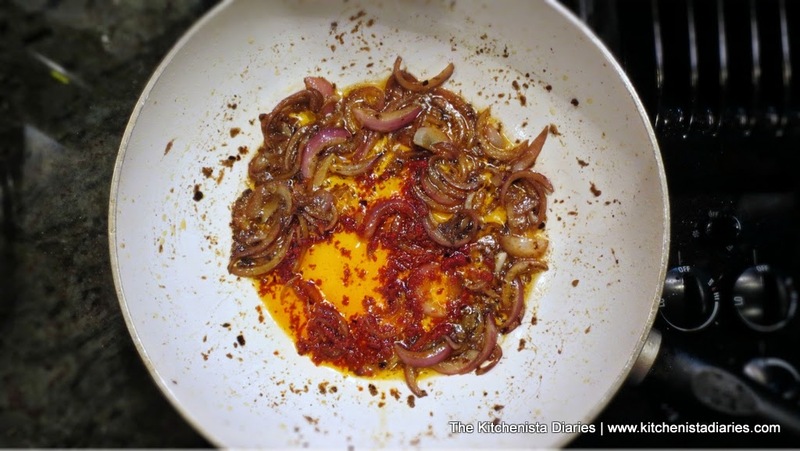 To the oil, add the anchovy fillets and red pepper flakes. 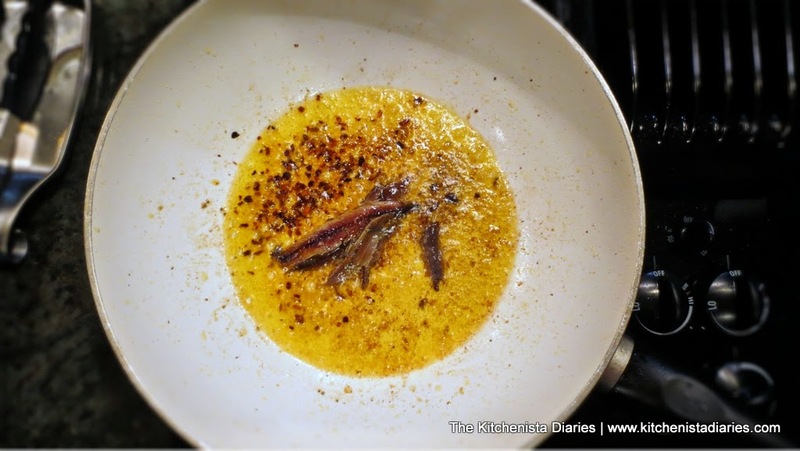 Mash the anchovies into the oil with your wooden spoon and you'll see them start to break up almost immediately. After a minute (you don't want the pepper flakes to burn) add the sliced onions to the pan and saute a couple minutes until they get soft. 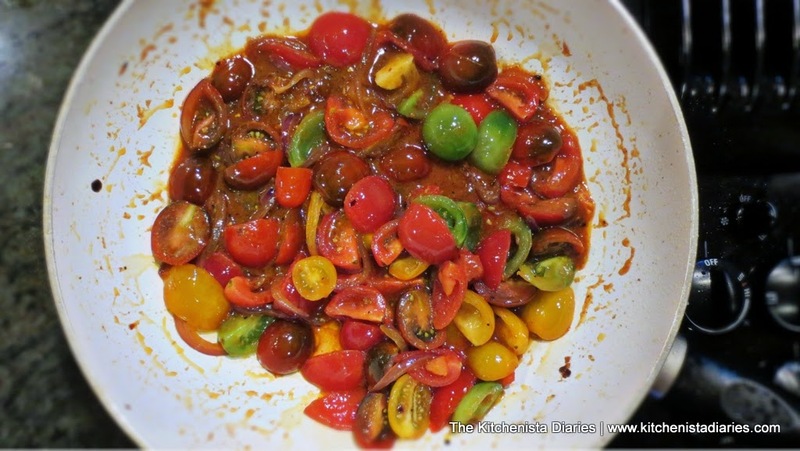 Now mash some tomato paste into your skillet. 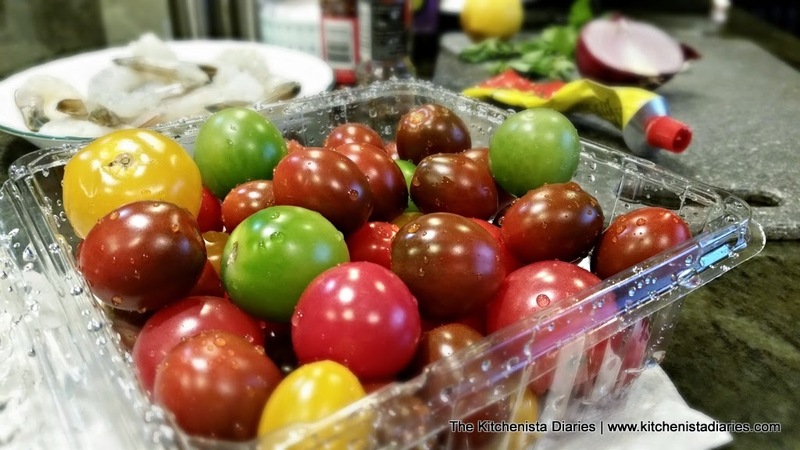 Allow it to cook for a minute or two to get out that raw tomato taste. 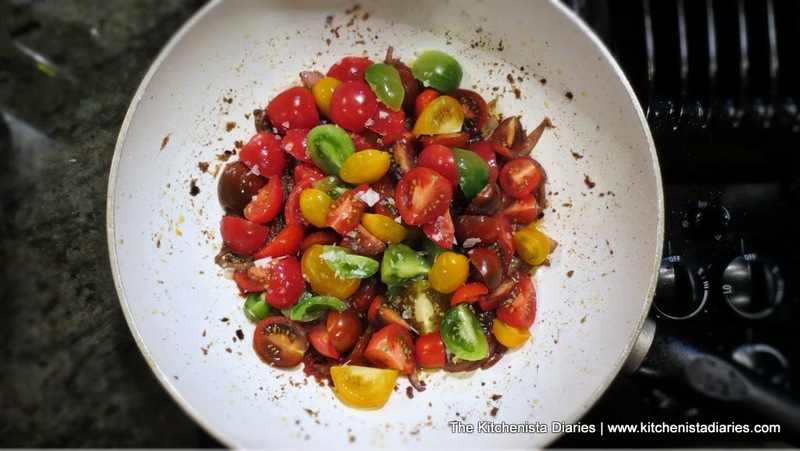 Add your sliced cherry tomatoes to the skillet and a pinch of sea salt. The tomatoes just need a little time now to start to break down and release their juices, so you can allow them to simmer over low heat. Mine took about 10 minutes to create a nice sauce but still have some of the tomato flesh left for texture. Once you're a couple minutes out, go ahead and start cooking your pasta - angel hair can stick really easily so it's not one I like to make ahead of time. 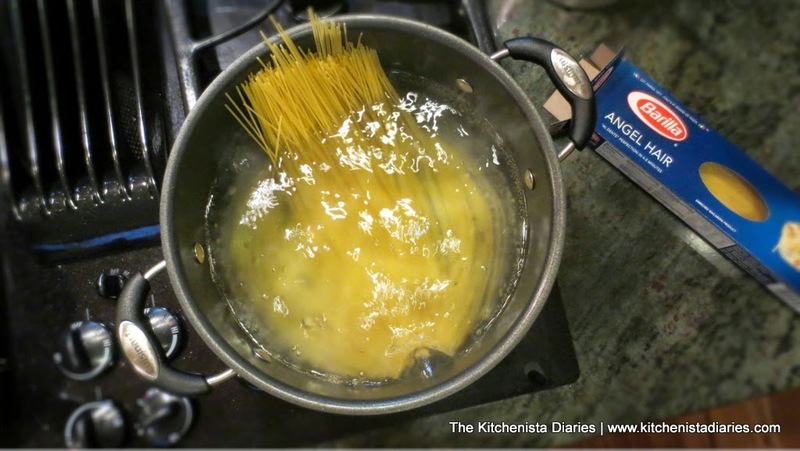 Add your pasta to boiling water and cook per package directions to al dente - about 3 or 4 minutes for angel hair. Stir the noodles occasionally to prevent sticking. The noodles should be tender with a little bite left; they will finish cooking in the sauce. While the pasta cooks, finish the tomato sauce off with a good squeeze of fresh lemon juice, torn fresh mint and basil. Season to taste with a pinch of salt and cracked black pepper, as needed. 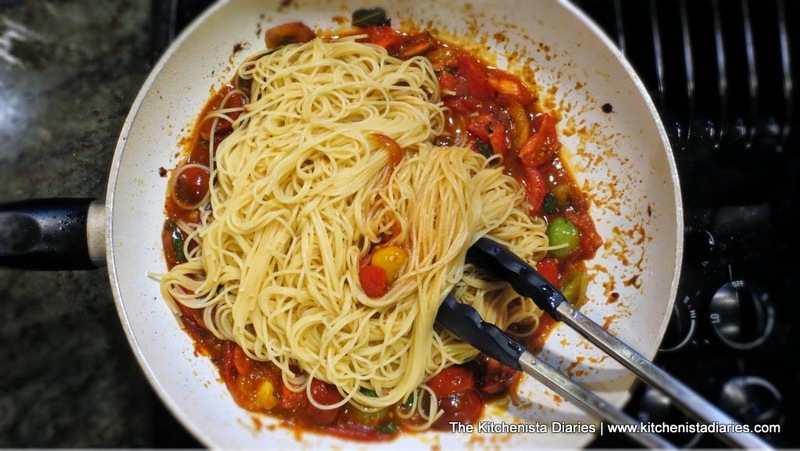 Use your tongs (or a pasta scoop) to transfer the cooked angel hair straight from the pot to your tomato sauce. Alternatively, you can dump the pot into a colander to strain the pasta but make sure you reserve about half a cup of the pasta water. I tend to just go straight from pot to skillet in this case, really no need to dirty another dish! 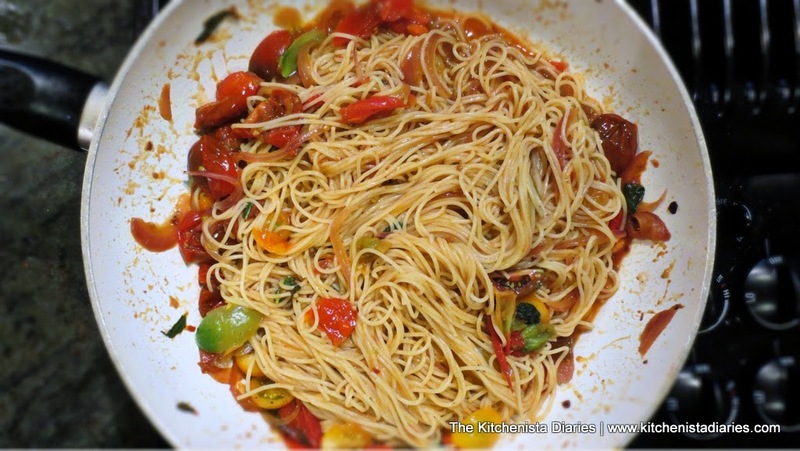 Toss the angel hair into your tomato sauce. This is always my favorite part when cooking pasta. Tongs are your best friend here. The pasta absorbs some of the sauce and finishes cooking - it's going to give your dish a much better finish than just topping off plain noodles with sauce on your plate. If you need to loosen up the sauce a little, just add some of the starchy pasta water until you get the right consistency. 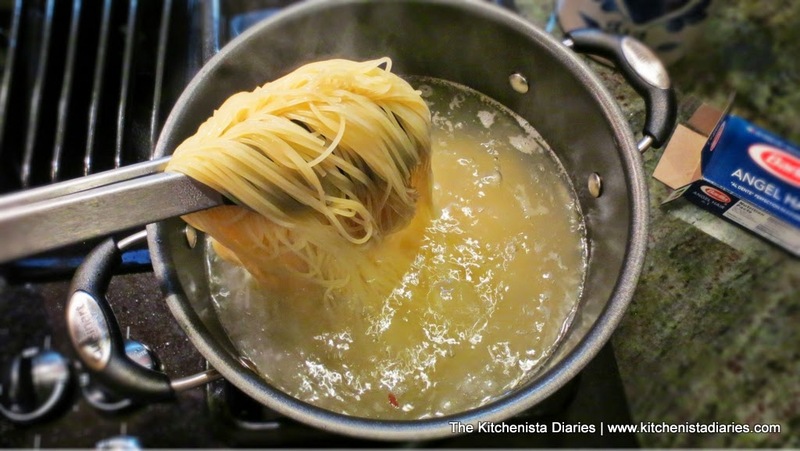 Your burner should be off at this point so as not to overcook the noodles. Finally, add the shrimp back in and just gently toss to warm through. Pasta is done! That's what I'd call time well spent - you'd be lucky to have gotten to a restaurant and placed your order by now! I don't think this is a pasta dish that needs Parmesan cheese, so trust me on that... just drizzle a little good olive oil to finish and you're all set. If you happen to have any leftovers, they are great cold!